We last reviewed the Brunton Eternas in 2003. Since then, Brunton has come out with a substantially revamped Eterna line. The old Eternas were somewhat heavy and rather large binoculars, but very solidly built with high optical quality for the price. They were available in 7x and 10x42 models that would focus down to a minimum distance of about 6 feet. The new Eternas look a bit different, with more stylish barrels and the Brunton logo prominently displayed on the sides, but how different are they? The answer to that is mixed: they're quite different in some ways, and notably similar in others. For starters, the new Bruntons come in unusual configurations: 8x45, 11x45 and 15x51! We received only examples of the former two models for review, so the 15x51 model isn't discussed herein. The new Eternas feel smaller in the hands, partly because of the ergonomically-shaped barrels, which feel more comfortable. Actually, they are only slightly smaller than the originals at 6" by 5.1". They have the same hefty feel, and they come by that honestly: our postal scale measured the 8x model at 31.2 oz. and the 11x model at 31.6 oz. Some of the other Eterna features remain comfortably the same. The new Eternas are made with BaK-4 glass prisms, and are completely sealed and nitrogen-filled to be fogproof, waterproof and dust-proof. Like all Brunton binoculars, the optics are secured with an extra set screw, to render them more resistant to being knocked out of alignment by little bumps in the field. Much of the rest of the optical package has been upgraded. Brunton incorporated state-of-the art phase coating, and a new AL reflective coating for the prisms. The aluminum in this coating provides not so much better reflection or higher light throughput than the silver more commonly used by other manufacturers. Rather, the aluminum ages better than silver does, particularly if the waterproof seal is ever lost. These Eternas also have the Emerald Fire™ full multi-coating although this coating has been improved. All of this may matter little to the average technophobe, but it translates to a very bright and true image. They show the same amount of edge distortion as the old models, and it’s about average for good quality binoculars in general. There was a slight suggestion of color aberration when viewing high-contrast objects under very bright light. In our hands, this tendency was more pronounced in the 11x than the 8x model. This manifests as a blue-shift at the edge of the field when viewing a particularly bright object, but it’s not something you would notice under normal viewing conditions. Brunton lists the new Eternas as having a minimum close of 8 feet, which would be a slight loss of functionality. We measured close focus at just 6.5 feet, which is about what the old ones did! Sadly, the new Eternas have a more limited field of view than the old ones, with 315 and 305 feet at 1000 yards on the 8x and 11x models, respectively. Eye relief is 20 mm on the 8x model and 19 mm on the 11x model, very comparable to the old Eternas. This makes them good for eyeglass wearers who need longer eye relief. So where then are the differences? Well, they’re largely in design features. The focus knob is no longer enclosed in the bridge, where it was slightly less accessible to the fingers. Instead, it sits on top of the hinge, and coupled with another design difference, the texture of the rubber armoring, this is a significant improvement. The new armoring is a little more pliant, and has a pebbled texture, where the old armor was smooth and rather hard, so it didn’t provide the most secure grip. Couple this with the larger diameter of the older barrels, and this design was harder for many to hold securely, particularly those with small hands, such as children. Not so the new Eternas, which have a nice surface that grabs the hand and feels better. So the grip is better, and the focus is somewhat easier and faster. The diopter adjustment is now a more traditional ring on the right barrel just below the eyepiece, a continuous adjustment with no click stops or locking mechanism. However, compared to the slider mechanism of the old Eternas, this is still a significant improvement. The eyecups on the new Eternas adjust with a counter-clockwise twist, and feature two click-stop intermediate positions in addition to all-in or all-out. This is a significant improvement. Dimensions (in inches) .1" x 5.0" 6.0" x 5.1" .1" x 5.0" 6.0" x 5.1" .1" x 5.0" 6.7" x 5.2"
Weight 30 oz. 28 oz. 30 oz. 28 oz. 30 oz. 32 oz. * Brunton is very restrictive with pricing and they strongly defend MAP (minimum advertised price) so these are about as low as the prices get. The ergonomic optimization includes several other items. The slotted outer barrels and flaring shape to the barrels (as opposed to straight tubes) are a big improvement relative to the old Eternas. Brunton also moved the posts for strap attachment more around the sides of the barrels where it contacts the hands less, increasing comfort of handling. Speaking of which, the strap is now very similar to the one found on the higher end Epoch model. The old Eterna strap was okay; the new one is better. In the case and lens cap areas, Brunton has retained the neoprene Bino-Glove™ though we hear this has been substantially re-designed in the new ones. We can’t comment since we didn’t receive the new case for review. The old Eternas had completely attached lens caps. The ocular lens caps swung out on hinges and could be positioned to block stray light, though many found this more irritating than advantageous. The objective lens caps were attached on tethers, which did prevent their getting lost, but again, were potentially a nuisance. The new Eternas don’t have lens caps per se. The re-designed Bino-Glove™ takes care of that function. Brunton also made the new Eternas tripod adaptable, which is likely to be needed more on the 11x and 15x models than on the 8x models. One other thing has remained largely the same: the price. The new Eternas have an MSRP of $530.00 for either model, but they can be found for as little as $449.00, meaning that the Eterna still delivers optical performance more characteristic of a high-end optic in the lower middle end of the price spectrum. This is the real trick: on the whole, the new Eternas are an improvement on the old ones, in some areas quite significantly, but they still retain the distinction of being a superb value in terms of optical performance obtained at a very reasonable price. 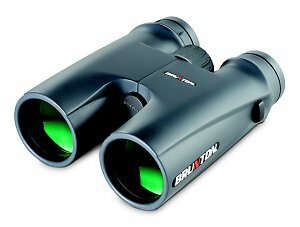 Brunton has discontinued all their binoculars. Fortunately, both Zeiss and Vortex have developed similar priced alternatives with even more advanced designs. Checkout Vortex and Zeiss alternatives.